Zimbabwe: Hey, Where Is the Commission of Inquiry? 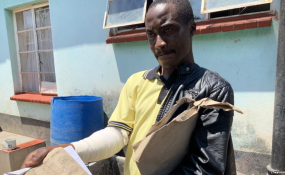 Adrian Munjere, who sustained fractures on his right hand during post-election clashes between security forces and protesters Aug. 1, displays his doctor’s report. Exactly six years and three days ago, members of the South African police opened fire on protesting workers at Lonmin Mine in Marikana, killing 34 of them after a week of violent disturbances over salaries. Exactly a week after, on August 23 2012, ex-president Jacob Zuma set up a commission of inquiry into the shocking incident. It's now 17 days since the Zimbabwean police teamed up with an army deployment to quell violent protests that erupted as results of the July 2018 elections were being announced and the opposition was trailing, according to official figures. At least six people were shot dead. President Emmerson Mnangagwa promised a commission of inquiry. We are, of course, still twiddling our fingers, waiting for Godot. Godot may be in the habit of not pitching up, but Godot must arrive at all costs. Mnangagwa has both legal and moral obligations to ensure that a commission of inquiry into the shootings is constituted and gets to work. Section 90 (1) of the constitution requires the president of Zimbabwe to observe, uphold, defend and obey the supreme law and all the other statutes. And section 90 (2) (c) says the president must ensure the protection of fundamental human rights as listed under chapter 4 of the constitution. Section 48 gives one such inalienable right as the right to life. This right must be looked at from two angles. Firstly, no one must wilfully and unnecessarily deprive anyone of life. In instances whereby a person has been deprived of life in such a manner, there must be a thorough and impartial investigation into the deprivation. There is a sense in which failure to investigate the deprivation must be considered a violation of the right to life, to paraphrase Kathleen Hardy, a legal practitioner. That says the president will be in wilful violation of the law for failing to instigate the composition of a commission of inquiry into the August 2 shootings. And that's impeachable, all other things being equal. So far, the only thing that comes close to a commission of inquiry is the mass arrest of members of the opposition who are currently on trial for inciting public violence. That's a very uncouth imitation of a commission, I say. Commissions of inquiry into such developments as protest shootings are not done just for their own sake. To start with, investigating the tragic incident will help heal wounds to a large extent. There is something soothing about laying bare the truth. The findings of the commission's probe will help pacify those that lost their loved ones. This will also go a long way in mollifying a restless, fearful and anxious nation. This will dispel grief and uncertainty. Ultimately, the inquiry could lead to some national healing in a community that is dangerously polarised in the post-election period. Besides ensuring that culprits are brought to book, it will lend a good measure of legitimacy to the sitting establishment. There is nothing as gratifying as a seeing a government that is ready to tell the truth about tragedies in which it might have had a hand. That is a great confidence builder. This is particularly important for Mnangagwa and his lieutenants who are currently being accused of all manner of excesses, ranging from electoral theft to human rights abuses, in the past and presently. The confidence that the commission would generate through an impartial and thorough intervention is naturally going to turn into a relatively positive perception about the Zimbabwean government and the nation, particularly where foreign investment is concerned. Mnangagwa currently looks so sorry for having sweated so much under his scarf to bring back international confidence since taking over from Robert Mugabe last November. What he laboured to build all this while has almost gone up in smoke owing to the manner in which the post-election conflict has been handled. Importantly also, probing the post-election violence and deprivation of at least six lives would show that the post-Mugabe dispensation is prepared to adopt a culture of constitutionalism and respect for the rule of law. This is what democracy requires. Business too. On the other hand, failing to probe the disturbances and violence that took place just after election results started trickling in will cast a big shadow on the government. It would seem as though the government is trying to hide its hideous and bloody hand. As it stands, there is a lot of speculation -- not entirely senseless -- around the killings. Many people out there suspect that at least one influential member of the executive made the unilateral deployment of the army as part of a shock-and-awe strategy. This would ensure that a restless opposition that seems to be convinced that it is entitled to form the next government gets to know its humble seat and remain there. An overzealous and unfettered opposition, together with its mass of supporters, so the thinking goes, is bad news for the individual and his cronies who want to remain in power and climb higher by any means necessary. If the protesters were let to do whatever they wanted in the streets, Zimbabwe would be ungovernable by now, as Nelson Chamisa had promised during the campaign period. In that sense, the powermongers in the current government had to send out the message clear and square. Kill at least five people so that these bastards know that we mean business, you can almost hear someone say. This would be particularly unsettling, if true. Since 2000 when the MDC sprung off the horizon and started giving the sitting government sleepless nights, nothing close to the August 2 events ever happened, barring the 2008 election violence. There have been big protests, but at no time did we get reports of people getting shot -- mostly in the back -- like that. There were murmurs of assassinations during last year's military-assisted takeover -- aka coup -- but certainly nothing like this. You would have expected more blood to be spilled during the coup, and the fact that it happened just recently is as chilling as it is ominous. Mnangagwa must set up an impartial and broad-based commission right away. He mustn't worry about the external experts that he said he wanted when he made the promise to set up the team. Zimbabwe has enough bona fide people to do the job. The commission must be given clear terms of reference, which must reflect a wide range of principles relating to the genesis of the killings and disturbances. It must consider the principle of precaution. Did the police and army take necessary precautions to avert the loss of lives? Was it necessary for the police to get reinforcements from the army? What was the basis for using live ammunition on the civilian protesters? Couldn't the law enforcers have used non-fatal methods of crowd control? Then there is the principle of agency. Were proper procedures followed in the deployments? Who gave what orders to who? In other words, there is need to vigorously investigate the chain of command. What, exactly, was the role played by the police and the army separately and jointly? Did those that brought arms to the scene account for their usage as stipulated by army and police weapon handling rules and regulations? Was the president properly advised and briefed? Thirdly, the commission needs to consider the issue of legality. Every crowd control intervention must be backed by legal justification steeped in domestic laws and international conventions. Was firepower used in a way permitted by the law? Which law, if so? After that, the commissioners must consider the issue of necessity. Was the use of live ammunition adopted as a last resort? And, finally, was the force used to quell the disturbances proportional to the protests? It mustn't be assumed that the inquiry should confine itself to the killings, of course. If you go back to the Marikana investigations, you will notice that they were multi-pronged. The commission probed the roles played by the police, workers' unions, the mining company and the protesters. Similarly, the Zimbabwean commission should have a wide attitude and focus on the police, army, politicians, party agents and protesters. It would be unfair to leave out, for instance, the role played by opposition leaders in the protests, which seem to have taken place without following the dictates of the law.